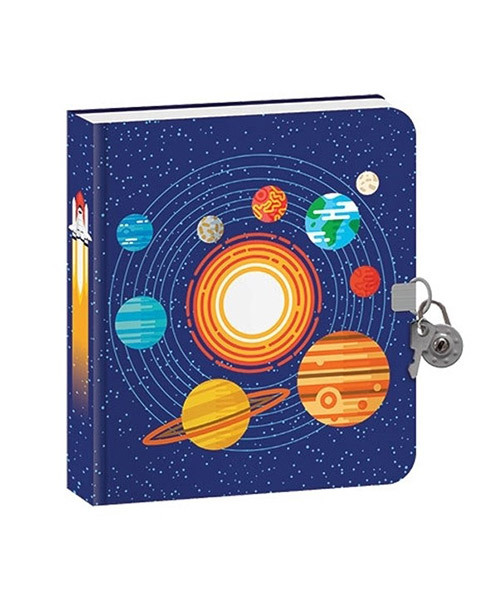 Our Solar System Glow in the Dark Diary keeps all your secrets safe. Whether it's your thoughts, drawings, or secrets, they'll be safe and sound in this fun and colorful lockable foil diary. It’s the perfect place to record all those special memories to last a lifetime. All diaries come with a lock and two keys. This diary is a must have for any youngster and is a great gift idea to inspire expression and fuel creativity. This sturdy hardcover diary contains 216 lined pages, with glow in the dark accents on the cover, and is acid and lignin free to preserve your secrets for a very long time.